While exercise won't tighten loose skin, exercises for a turkey neck can help diminish its appearance. By tightening the muscles of the neck, you can help reduce the skin wattle known as turkey neck, no matter what is causing it. 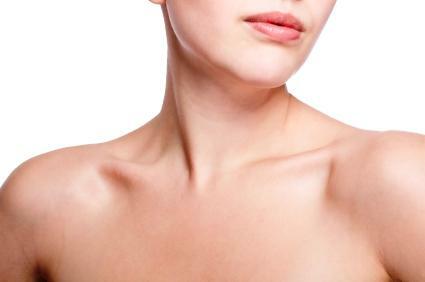 Turkey neck is the name frequently given to the loose fold of skin on the neck running from the jaw to the top of the chest in some people. There are a few causes of turkey neck, all of which result in this same loose fold of skin. Rapid weight loss and the loss of a "double chin"
No matter what is causing your turkey neck, the only way to completely eliminate it for good would be to remove the excess skin. It is possible, however, to use jowl, throat and neck exercises to help tighten the muscles beneath the skin. As the muscles firm up, they will pull the skin tighter across the neck region, helping to reduce the appearance of the turkey neck. Frequent neck exercise can also help to prevent this sagging from taking place, by keeping the skin and muscles of the neck in good condition. These exercises can be done at any time, and do not require special equipment. Like all exercise, the more you work the muscles of your neck, the more quickly you will see results and the more dramatic the results will be. Sit or stand with your back straight and shoulders relaxed. Look up toward the ceiling, pointing your chin as far north as you can. Move your lower lip forward and up to cover your upper lip, and tighten the muscles and skin of the neck. It should feel as if you are gulping air like a fish out of water. Repeat 10 times, relax and repeat the exercise five times. Sit or stand comfortably with your back straight and shoulders relaxed. Point your chin toward the ceiling with your mouth closed and face relaxed. Press your tongue firmly into the roof of your mouth, flexing your neck muscles just beneath your jaw. Keep the pressure from your tongue on the roof of your mouth as you pull your chin down toward your chest. Relax and repeat the exercise 10 times. Lay down on a flat surface. Keeping your head on the ground, tilt your head backward so your chin points upward toward the ceiling. Keep your head tilted back like this, and turn your head to the left and right. Hold each position for a count of five, relax and repeat. Stand or sit relaxed with your mouth closed. Circle your tongue inside your mouth to the right or left 20 times. Relax and circle your tongue in the opposite direction 20 times. Stand or sit with your back straight. Purse your lips as far forward as they can go and extend your chin forward until you feel your neck muscles tighten. Hold this pose for 10 seconds, relax and repeat five times. Tightening muscles with exercises for a turkey neck can help diminish its appearance. For best results, combine these moves with exercises for jowls and the face. As you work at and tighten one area, the benefits extend to other areas as well. Exercise your neck and face at least four times a week for best results, and start to see your turkey neck tighten and lift back into place.